Researcher Kevin Wright checks part of the experimental apparatus. 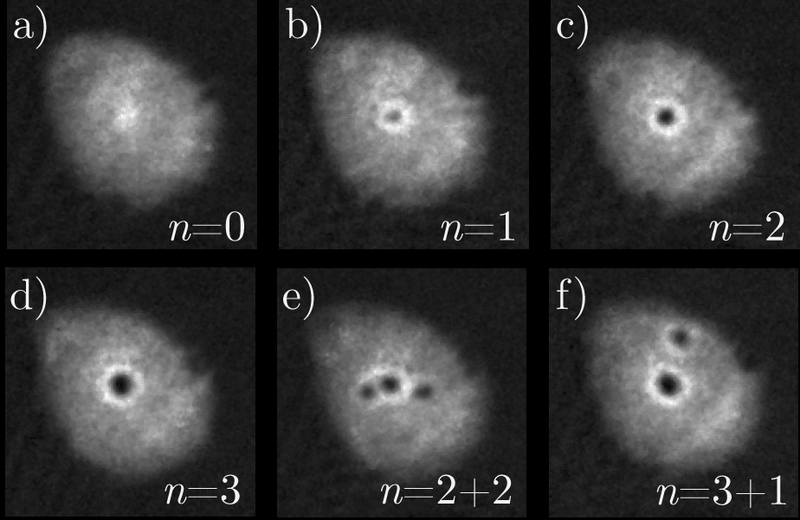 Absorption time-of-flight images show quantized stages in the central vortex. Images (e) and (f) show off-center vortices forming in the condensate when rotation speed exceeds a transition point, just as a voltage appears in a traditional Josephson junction when current exceeds a critical value. PFC supported scientists at JQI have created the first controllable atomic circuit that functions analogously to a superconducting quantum interference device (SQUID) and allows operators to select a particular quantum state of the system at will. By manipulating atoms in a superfluid ring thinner than a human hair the investigators were able for the first time to measure rotation-induced discrete quantized changes in the atoms’ state, thereby providing a proof-of-principle design for an “atomtronic” inertial sensor. SQUIDs work because of a fundamental property of superconductors: When exposed to an applied magnetic field, a ring of superconductor generates currents which produce magnetic flux exactly canceling the external field. When the current reaches a critical value (determined by a junction or weak link in the ring), it “jumps” by a discrete amount, allowing a quantized amount of flux to penetrate the ring. Measuring the effect of that action on the current across a junction allows one to measure the strength of the applied field, and SQUIDs are routinely employed to detect very weak fields such as those produced by brain waves or nerve impulses in muscle tissue. Campbell and colleagues in the Laser Cooling and Trapping Group have long been investigating analogous behavior in toroidal Bose-Einstein condensates (BECs) – ultracold, donut-shaped ensembles of atoms that are all in the same quantum state and form a superfluid. To create rotation, which is the superfluid counterpart to external magnetic fields in a SQUID, the team introduces a green laser beam perpendicular to and penetrating the plane of the superfluid ring, and slowly rotates the beam around the ring. (See animation.) The beam acts as a sort of optical paddle, causing the superfluid BEC atoms to rotate. Just as a superconducting ring admits flux when the current exceeds a critical value, the ring of superfluid admits a vortex, resulting in a change in the circulation of atoms around the ring. Like everything else in the quantum world, the properties of those vortices are quantized – that is, they occur only at discrete values, and lead to quantized circulation states in the BEC. 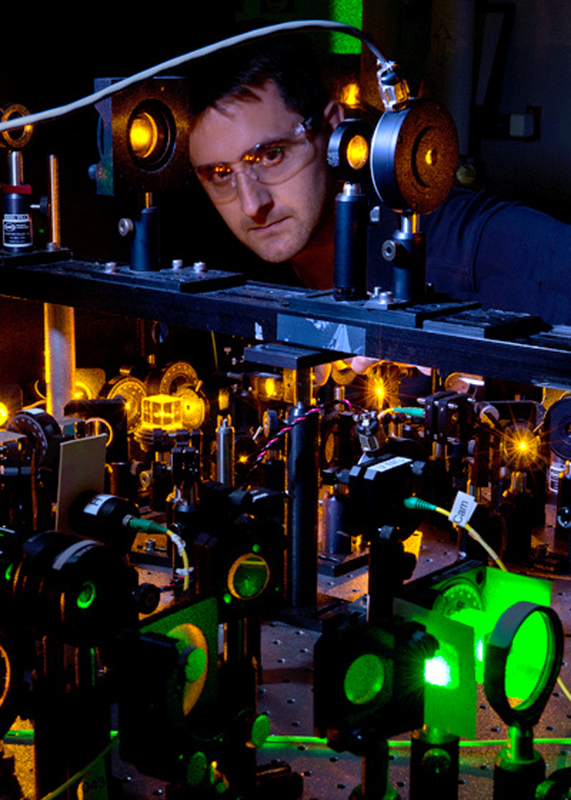 Campbell’s team was able to observe and measure those quantum increments and for the first time was able to control the onset of discrete circulation states by tuning the power and rotational speed of the green laser. "We're just at the beginning," says SQUID expert Chris Lobb, a team member from the University of Maryland Department of Physics. “Hopefully, as we learn more about the capabilities of these devices, powerful applications will emerge. The ability to easily vary the coupling strength and current-phase relationship of the weak link is unique to this system, and will lead to new devices." In a forthcoming paper,* the team describes the experiment in detail. Sodium atoms are first confined in a magneto-optical trap and then cooled in an optical trap until about 600,000 atoms form a BEC. Intersecting laser beams (1064 nanometer wavelength) are sent through the BEC, shaping the cloud into a torus about 40 micrometers in diameter with a density that is nearly uniform azimuthally. Perpendicular to the plane of the torus, a laser beam with a wavelength of 532 nm penetrates and disrupts the BEC, forming an approximately 8 µm thick, low-atomic-density barrier that is made to rotate around the ring at speeds ranging from 1 Hz to 4 Hz, setting the atoms in motion. "The atomic cloud is incredibly cold and very sensitive to imperfections, so the main challenge in getting the experiment to work is smoothing and stabilizing the intensity of the laser beams,” says first author Kevin Wright. “To achieve reliable control of the atoms in the ring, the combined intensity of all of the lasers has to be smooth and remain steady to better than one percent." To determine how the circulation state of the ring-shaped condensate varies with barrier rotation speed and beam strength, the researchers turn off the trap potential and obtain images of the atoms’ configuration after 10 milliseconds time-of-flight. The images show that at very low rotation speed the atoms remain motionless; but when the rotation speed hits a critical value, the atoms instead form a vortex at the center of the ring that expands in quantized steps as the speed increases. This vortex corresponds to a quantized current state in a SQUID. As the rotation rate increases, however, off-center vortices form as a result of differential rotation speed between the inner and outer sections of the ring. This system is, in effect, a rotational sensor. “In a magnetic SQUID operation, you bias the magnetic field of your system very close to what you want to measure, such that even a tiny external field pushes you over the edge,” Campbell says. “We could do something similar to measure rotation. Suppose we know that our system jumps at half a hertz, and we want to measure something around 0.1 Hz. We could start rotating our system at 0.4 Hz, and then that little bit of extra rotation – say the rotation of a vehicle – would push it into a different, measurable quantum state.